OnServiceFailure is a NT service that will keep constant watch for failures of other services running in the system. You specify which services to monitor. When a failure is discovered an email is sent to the recipient of your choice and OnServiceFailure attempts to restart the failed service. 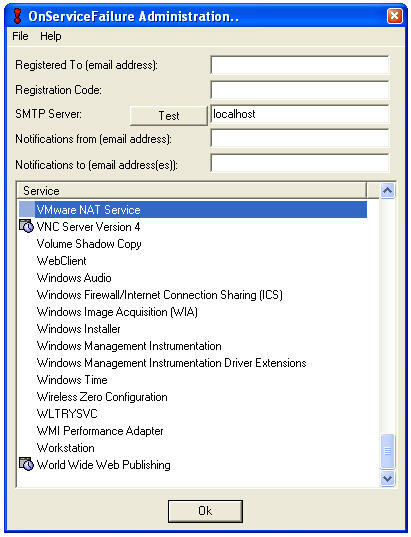 Version 1.1 (11/7/2004): Added custom service startup handling (ie.. you can run your own batch scripts to restart your service). OnServiceFailure is free to try for a period of 30 days. If you are satisfied that the program handles all your requirements then you are asked to purchase a registration for its continued use. The license cost is $20 per server being monitored.